I am totally addicted to Twitter. One afternoon as I was driving, I saw my phone light up with a Tweet from designer Patty Young. She was looking for new pattern testers for her new girls' clothing patterns that are coming out at the Fall Quilt Market. Needless to say I jumped at the chance. 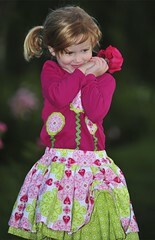 It's a two layer skirt with a shirred drawstring that shows off the underlayer, and appliques put onto a purchased top. I used fabrics from Patty's Mezzanine fabric line. Maybe it's because I'm a child of the '80s, but pink and green as a color combo just make me smile. I got to use my new Pfaff overlocker on this pattern that I got for my birthday. And I got to use that great dark green large rick rack that I bought during my first Shop Hop. The pattern went together like a breeze, and Patty's pattern was laid out beautifully. The fabrics from Michael Miller are a very nice quality. Over all, more fun than I think one sewer should get to have! P.S. Fabric was purchased online at Above All Fabric.